The first house we lived in after moving to Khartoum had an air of danger to it. There was something there that never felt right. A small rock garden by the entrance held over a dozen types of cactus. Some had big flat leaves, others furry yellow spines that stuck to your fingers and were impossible to remove. We were warned not to play there for fear of scorpions. It could have been a scorpion that killed the duck we kept in the back garden. We liked to think it was a snake after having discovered a sloughed off skin, dessicated and translucent, sitting on top of some dusty packing cases in the disused garage. Our cat staggered in one morning foaming at the mouth with rabies. There were dark corners in that house and it was overshadowed by the ghost of the previous occupant, a man who had managed to electrocute himself by carrying a standing lamp out onto the damp lawn one evening to read by. It was in that house my father told me, years later, that he had spent the night with some of the conspirators who were involved in the attempted coup of July 1971. He was close friends with several prominent members of the communist party, though not himself involved, which is probably why they chose to stay there. They spent the night smoking and drinking, making phonecalls, waiting. In the morning he drove them around town in the family car to see what had happened. It soon became apparent that the coup had failed. Nimeiri had managed to mount a countercoup and the plotters were being rounded up. Many were executed, others fled the country or went into hiding. My father came home that day prepared for the worst. He wrote out forward dated cheques so that my mother would be able to survive while he was in prison. How far did he go, I wonder? Three months? Six? How long did he think he would be detained? It was out of character, reckless and the most overtly political thing he ever did in his life. The episode had a profound impact on him and his health. When Jaafar Nimeiri first came to power he seemed invincible. Young and dynamic, we watched him on our old black and white Hitachi television, standing up in an open car, riding on the roof of a train, waving an ebony staff over his head, clasping his hands together in fellowship. A man in constant motion. North south east west. He was everywhere and nowhere at the same time. Women ululated, men sang and everyone cheered. He was forever opening new development projects; irrigation schemes, engineering colleges, housing complexes. We saw him leaping over bulls that were laid down in the sand before him, their throats slit in sacrifice. With the signing of the Addis Abeba Agreement of 1972 the civil war in the South came to an end. Not that we had really seen much of the war. It was distant and low key and seemed more remote even than the Palestinian struggle. There we were subjected to daily propaganda messages, revolutionary songs and images of Fedayeen fighters leaping over trenches, crawling under barbed wire. Palestinian women in rags came to our door asking for food. If we didn’t eat up our lunch we would be reminded of the children starving in the refugee camps. The South was a world away, inhabited by the lanky men we saw working on building sights. Wearing cut off shorts slung over bony hips they balanced sand in square–sided jerrycans on their heads as they climbed flimsy scaffolding. It hardly registered that these people might be at war with us for a reason, for a lot of very old reasons. Nimeiri led a charmed life. Later on he would convince himself that this was not accidental. Once, while leading a column of tanks in the South he had climbed down from the turret to walk back to the vehicle behind him to beg some snuff from the vehicle behind him. While he was standing there a shell landed on his tank, blowing it to pieces. He was a handsome man who bore a vague resemblence to the boxer Muhammed Ali, who was a hero all across Africa and was to meet Joe Foreman in Kinchasa in 1974 for the famous ‘Rumble in the Jungle’. Nimeiri epitomised the progress of the nation. Through him we believed we were destined for greatness. In Civics class we learned how the country was developing. There were ambitious five year plans for this and that. We memorised figures for fish hauled from the Nile, how many hectares of wheat and dura and sugar cane we produced. The photographs in the book revealed a country to be proud of; fields of bobbing white cotton, shiny new factories. We would feed the world, become the breadbasket of Africa. We didn’t need oil. We had water and land enough to grow food for the entire continent. 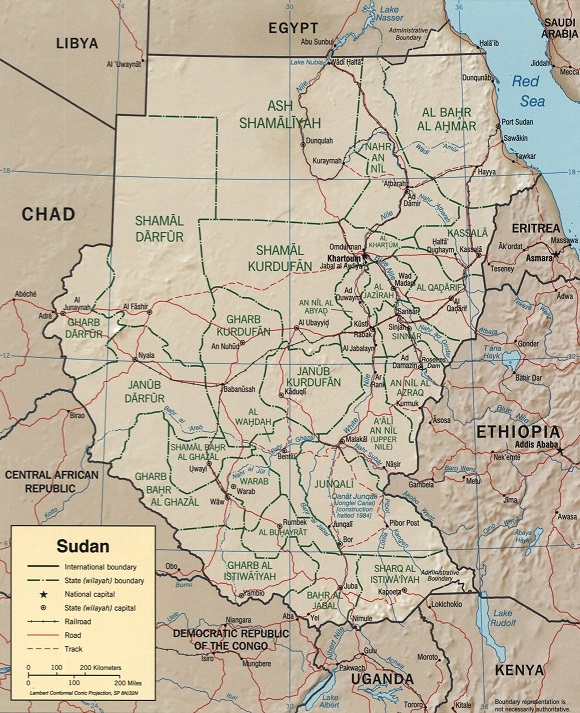 Map of Sudan at the time of the second civil war, 1983-2005. Source: Wikimedia. A year after he came to power, Nimeiri nationalised everything in sight beginning with the banks and foreign companies and ending with restaurants and cinemas. He overhauled the administrative system, devolving power back to the nine provinces and away from the capital – a move that would come back and haunt him. The Addis Abeba treaty was the crowning achievement, bringing an end to a civil war that had been going on for seventeen years, since before independence. The country was finally at peace with itself. Nimeiri had succeded where all other previous attempts, civil and military governments alike, had failed. The enigma of who or what Nimeiri really was remains. When he first stepped onto the podium he was a young colonel inspired by Nasser. Like their Egyptian counterparts, the men of the Sudanese Free Officers Movement were driven by discontent. In the South they were fighting a war they could not win, while back in Khartoum the politicians bickered and quarrelled amongst themselves. The early years held great promise. Nimeiri had come, he declared, to sweep away all that had gone before. He signified modernity and change. Revolutionary purity would purge the system of favouritism, immorality and corruption. The old guard was replaced by new thinkers; academics, technocrats. It was to be about merit rather than personal influence, a radical notion in a society where family and tribal allegiance always trump ideology. The nation came together behind him. The Presidential Palace was renamed the People’s Palace. In the school yard we did Chinese calisthenics, raising our arms and bending our legs in time to the commands from a military man with a microphone. The nation was energised by socialism. When visiting heads of state arrived we were ushered out of class to stand by the roadside and cheer the presidential cortège. We were part of the collective spirit that united north and south, Christian and Muslim, east and west. In those first five years Nimeiri went a long way towards setting the country on the path to achieving its potential, something we all dreamed of. He seemed like the embodiment of the promise that lay in the grand idea of a Sudan that was big enough to encompass its own internal contradictions. He came to symbolise the idea of belonging, of inclusiveness, of nationhood. Behind the popular rhetoric, however, so much of what we wanted to believe turned out to be part of an elaborate fairy tale. Did we hear what we wanted to hear? What began as an adventure, a bold attempt to unite the nation as one, to work towards the greater good of all, ended in pathetic failure. The broad scale of the vision was whittled down to war and starvation, to persecution, bitter recrimination, paranoia, cruelty, sectarianism and supersition. It was short lived, but still, those early years remain a reminder of what might have been. By the late seventies Nimeiri had begun to believe in his own myth. He became more concerned with re-jigging his story rather than making history. In a ghost-written book published in 1978 he claimed that Islam had always been at the core of his thinking. A patent lie, it was a vain attempt to realign himself. By then his health had begun to deteriorate. He suffered from arteriosclerosis and diabetes along with liver damage from excessive drinking. Significantly, he had also survived a number of coups. He came to believe divine intervention had saved his life, not mere chance. He had cheated death by changing his routine. It had to be more than good luck. How quickly the euphoria of the early years evaporated. A gap had emerged between the aspirations of the skilled middle classes and the opportunities available. People moved abroad, crossing the Red Sea for the oil rich Gulf states. Islamism replaced socialism. Hassan al-Turabi, in a move that presaged the Islamist takeover of 1989, was installed as Attorney General. State ownership gave way to economic liberalisation; liquid assets, shares, state land, petrol and gas were sold off. Corruption proliferated. Those closest to him profited the most. The Islamic banks were brought in. The great development plans vanished in a spiralling confusion of serious debt with bank loans for hundreds of millions of dollars being borrowed at extortionate rates for projects that never materialised. Refineries that were never built, cement factories that never arrived, helicopters delivered that no one had asked for. In a way it had all come too late. Nasser’s death in 1970 marked the end of Pan Arabism. The oil boom brought a level of wealth never dreamed of to the Middle East. To many this new decadence was a betrayal of traditional values. Images of ‘oil sheikhs’ at play in the West were viewed as shameful. They lent wings to a new wave of puritanism sweeping through the region. In Mecca, an apocalyptic sect of radicals seized the Sacred Mosque in a bid to redeem Islam. In Egypt, Anwar Sadat was gunned down in October 1981 by members of the Islamic Group, a radical faction guided by Sheikh Omar, the same blind Imam who later passed through Khartoum only to surface in New Jersey linked to the 1993 attack on the World Trade Center. Further afield, the Soviets invaded Afghanistan to find themselves fighting the Mujahideen. Nimeiri was ahead of the curve, already riding the Islamist wave. 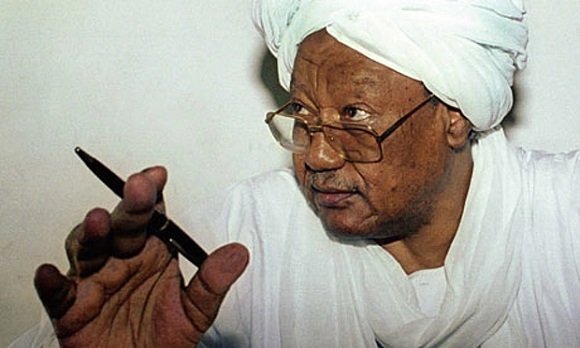 Twelve short years after the Addis Abeba agreement he imposed Islam on the entire country, re-ignited the war and undid much of what he had achieved. Where he had once sought to eradicate the traditional Islamic parties, now he tried to achieve what they had never achieved - what the Mahdi himself had led his followers into battle for one hundred years earlier: A pure Islamic state on earth. The coups, the ill health, everything seemed to be conspiring to push him towards his mystic leanings. Like some latter day Lear, he descended into the madness of self-delusion, gradually whittling away the country’s political institutions to leave him the unchallenged master, the imam of all imams. His closest advisors were reduced to a secretive palace cabal of religious seers, magicians and soothsayers. Under the newly imposed September Laws, a personal and brutal interpretation of Sharia, hundreds of people, many of them non-Muslims, were condemned to amputation of the right hand for petty crimes, or cross-amputation - where the right hand and left foot are simultaneously removed. The Sudanese Bar Association concluded that the September Laws were ‘unconstitutional and not a true reflection of Islamic law.’ It hardly made a difference. In an open letter to academics in 1983, Nimeiri likened himself to Haroun al-Rashid, the 8th Century caliph of Abbassid Baghdad. He ordered the release of thirteen thousand inmates from the city’s prisons. When he addressed them at Kober prison, Nimeiri told them he had forgiven them, just as the Prophet Mohammed had forgiven the people of Mecca. In a country of saints and Sufis, the president had come to believe in his own divine mission. In January 1984, a year before he was ousted, TIME magazine summed up the state of affairs in the country. President Nimeiri had started the year, it said, by pouring a can of beer into the Nile. The first drop of five million dollars worth of alcohol (later estimated at 11 million). Thousands lining the riverbank had cheered. Two weeks earlier, wrote the correspondant, a crowd of five hundred had watched a thief have his right hand amputated. Meanwhile, only ten percent of the 200 million acres of arable land in the country was being cultivated. 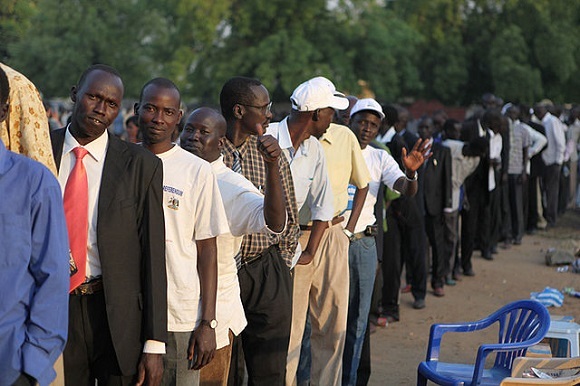 Sudan was eight billion dollars in debt and crippled by shortages of goods, skilled workers, even electricity. In the south the war was reborn as a religious jihad. At stake was the exploitation of two natural resources, water and oil. 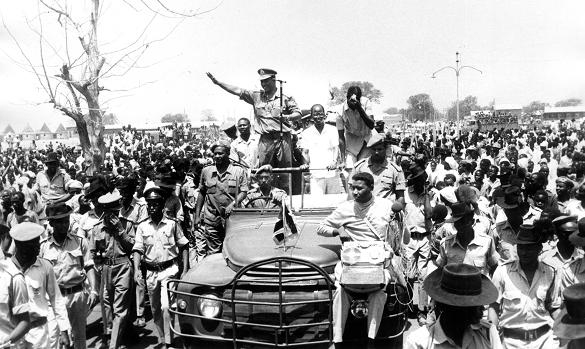 As Khartoum went back on its promises a hostile political climate emerged. The South saw their natural resources being lifted from under their very noses. Around the Bentiu area petroleum exploration that had been going on since 1978 suddenly turned serious. Preliminary reports estimated some 50,000 barrels a day (a tenth of current figures) which would bring in around 250 million dollars a year. A refinery was being planned for the North. Again, this was not reassuring. It reinforced the impression that the oil would be siphoned out of the South as fast as possible. In March 1984 John Garang’s SPLA attacked Chevron’s oil installations and war was back. The Nimeiri era remains one of the most beguiling and contradictory in the country’s history. It defined so much of what was to come. The rise of Islamist politics, the loss of the South, the corruption, the cronyism. From bringing out the best in the nation he left us with the worst. Of all the country’s rulers, Nimeiri was the one who came closest to achieving the dream; a nation united, a nation that celebrated its diversity rather than suppressed it. Like all heroes, he was deeply flawed, convinced in the end that it was not the nation that came first, but himself. By the 1980s, age and mortality were catching up with him. In the end he succumbed, falling back on old prejudices, confusing his role as his God given right. The decade is remembered now for the images of famine in Eritrea that turned Africa into the helpless child holding out an empty bowl. Africa was once again reduced to the notion of the continent as one unfathomable, endless catastrophe. It was a sad end. Surprisingly, the old house is still there. The garden has been buried beneath a layer of concrete and turned into ugly office rooms. It’s a reminder of just how lucky we were back then, to have the space to breathe. All over the neighbourhood, the old villas have been ripped down and replaced with multistorey appartment blocks. The streets frequently flood as the old drainage system, installed by the British back in the 1930s, falters under the pressure and the dirty water bubbles up from the ground. It’s as if the past will not go away. So much has happened in this country’s history and yet we can’t seem to get over it and move on. It refuses to go away. Instead it keeps coming back, challenging us, asking us to try and understand what it is we haven’t yet grasped. This essay by Jamal Mahjoub on his youth in Khartoum was written at NIAS and published in the july-edition of Chimurenga journal, a South-African magazine. was writer in residence at the Netherlands Institute for Advanced Study in the Humanities and Social Sciences (NIAS) in Wassenaar from 1 February 2015 - 30 June 2015, upon invitation of the Dutch Foundation for Literature and the NIAS. During his residency Mahjoub worked on a non-fiction book about the history of Sudan, a Sebaldian mix of memory, reflection and philosophy.